The Qinqu Jicheng preface, giving background to the history and contents of Xilutang Qintong. The Table of Contents, listing all the melodies and adding links to those with further commentary and/or translations of lyrics. However, I have not worked out their rhythms to my satisfaction. 35587.845 西麓 Western foothills; various nicknames. The book was compiled by 汪芝 Wang Zhi of 歙縣 She county in Anhui province. "Qintong" seems to refer to the musical analysis placed at the front of the book. However, little effort seems to have been made to connect the actual melodies in the handbook with this theoretical system. See QQJC III/58 and compare the image at the top of this page. See further details on their sources. There may be more as well. By "learned" I mean completed my dapu (reconstruction), including working out my interpretation of the notes and note values, writing this out as transcriptions into staff notation, learning to play them from memory, then recording them. See recordings. In general I have focused my dapu on the earliest version of any particular melody. Thus, except for #2 Gong Yi, the melodies listed above are the earliest published versions of those titles. In 2013, because of an upcoming conference, I particularly worked on melodies from Folios 6, 7 and 8. Earlier published versions of nine of these 24 melodies had already appeared in Shen Qi Mi Pu (1425); I had reconstructed and recorded of those nine as part of my Shen Qi Mi Pu Project. Of the remaining 15, all but Shang Yi, which is related to the Shenpin Shang Yi in Shen Qi Mi Pu, have their earliest known version here in Xilutang Qintong. I had completed transcriptions and recordings of six of these 15 from Xilutang Qintong itself when, in anticipation of the conference, I began a project of also reconstructing the other nine of these 15. For the sake of historically informed performance I think it is very important that people work independently on their own versions of a particular melody, then afterwards discuss why they selected the note values they did. My plan was to be prepared to discuss all 15 of these melodies. A few months before the conference I submitted three of these new reconstructions to the organizers; unfortunately, I was not able to attend the conference itself: we had just moved from Singapore back to the New York area. After we got settled back in our home I went on to complete my reconstructions of all 15 melodies. In May 2014 I put together a home-made CD that includes these 15. It is my understanding that the organizers of the Xilutang Qintong conference intend to publish a CD of the reconstructions made at that conference. I look forward very much to hearing it, and it is my hope that my own efforts will become part of a further discussion of the parameters within which ancient melodies are and might be interpreted (see comment on different attitudes towards the process of "dapu"). My recordings can also all be heard in mp3 format by following links below to the respective pages on this website. Quite a few of these were reconstructed rather quickly in preparation for the conference. Thus, at present, the rendering here of these pieces often tends to be more rhythmic than those melodies I have played for a long time before recording (further comment). Perhaps most difficult of these for me was the 1525 Feng Lei. 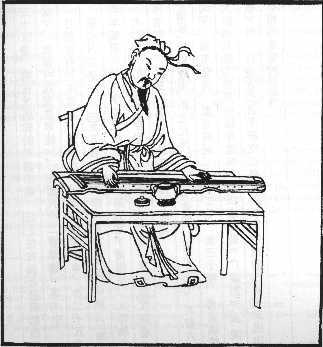 My main sources, such as Zha Fuxi's Guide, said that Xilutang Qintong was produced in 1549, making it later than Fengxuan Xuanpin (1539). So originally I reconstructed the 1539 version, Feng Lei Yin, thinking it was the earliest; it was only while preparing for the conference that I discovered Xilutang Qintong must have been published in 1525, not 1549, and so its version, called Feng Lei, was in fact the earliest, at least the earliest in publication. However, this earliest version proved particularly difficult, perhaps because my version of the 1539 Fenglei Yin was so imbedded in my mind that I had great difficulty imagining the melody in such a different form. However, in April 2014 I did complete my reconstruction of the 1525 Feng Lei.